Fifa will investigate the alleged distribution of a dossier highly critical of Uefa president Michel Platini from its Zurich headquarters. European football governing body Uefa has complained to Fifa about an "alleged smear campaign". The 60-year-old former France midfielder, is running to succeed Sepp Blatter, 79, as Fifa president. The dossier allegedly questions Platini's decision to vote for Qatar to host the World Cup in 2022. The 1,400-word document entitled 'Platini: skeletons in the closet' was sent anonymously to several newspapers, reported German newspaper Welt am Sonntag. The newspaper claimed it painted an unflattering picture of Platini and doubted his suitability for the role of Fifa president. 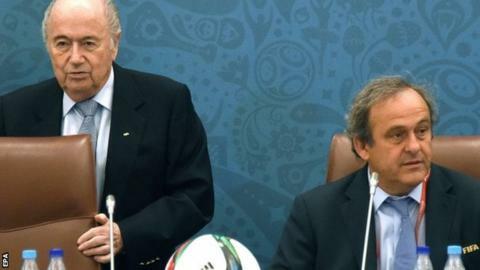 Platini will contest the election with former Fifa vice-president Chung Mong-joon of South Korea, ex-Brazil player Zico and Liberian FA chairman Musa Bility.